Easy access...park just steps from the door! Brand new state-of-the-art offices, consultation rooms and procedure suites all built with efficiency and your convenience in mind. Dr. Roth is a Perennial Top Doc! 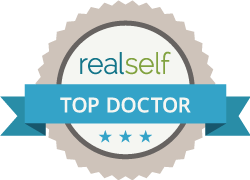 Dr. Roth has been chosen as a "Top Doc" for 13 Years and counting! Las Vegas Plastic Surgery Inc. is a patient oriented Cosmetic surgery practice established in Las Vegas, Nevada. A hometown boy, Dr. Jeffrey Roth got into medicine for one reason - to make a difference in the lives of the people of Las Vegas. His philosophy is simple: the patient always comes first which is why he offers a full range of aesthetic procedures at his practice, Las Vegas Plastic Surgery, Inc. Whether you are interested in a breast augmentation, CoolSculpting, or the very latest in injectables, his goal is to help you to feel like the very best version of yourself. Board certified by both the American Society of Plastic Surgery and the American Board of Surgery, Dr. Roth uses his exemplary skill, warm demeanor and extensive experience to boost your outlook on life by restoring your confidence in your body, your mind and your heart. “12 DAYS OF HOLIDAY SAVINGS” STARTS THURS. DEC. 6TH! Join us for Dr. Roth's "12 Days of Holiday Savings"! December 6th - 21st. A different Super-Special everyday! Call 702.450.0777 for more details! Dr. Roth’s Annual Black & Gold Party! Cool Event at Dr. Roth’s: 7/24/18! 06/28/2018 5:00 - 7:00 p.m. Cool Event at Dr. Roth’s: 5/23/18! 05/21/2018 5:00 - 7:00 p.m.
JJR LV MED DIST. MEETING 2/27/19. Dr. Roth discusses CBD skin care with KTNV Channel 13. Dr. Roth’s Featured in a segment / interview with Markus Rothkranz. FEAR NO MIRROR® and eliminate unwanted fat in half the time! Schedule your CoolSculpting session with Dr. Roth today!